Building a new log home is a big step and the home you choose to build should be unique to you. A Ward Cedar Log Home is created just for you – a home shaped by your individual tastes, preferences, and building site. No two homes are the same. How much can one modify? Well that all depends on you. Start with a plan from any one of our design series and use it as a springboard for your ideas. Make any modifications you wish. Even combine features from one home plan with another. You may move windows, walls, and doors, add on to the home or downsize it, add a second floor, change the roof pitch, etc. Still don’t see what you want? Not a problem. 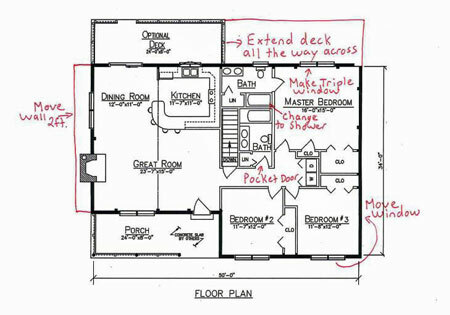 Many homeowners over the years have bought us photos of home styles they love along with a rough floor plan sketched on paper. We have even seen ideas brought to us on napkins. What was once just a dream – just a glimmer of possibilities – is transformed into a log home you can enjoy for many years. It’s not just the plans you can modify. Feel free to modify the log home package itself. Want to delete the shingles? Go ahead. Do you wish to have a different brand of windows? Windows can be taken out of the materials package as well. The possibilities are endless. Ward Cedar Log Homes is available to work alongside with you to create the perfect home. The top picture is a standard plan of the East Grand and the bottom picture is what the homeowner ended up with after all their changes. Not only did they change the plan, they also decided to go with the Hybrid home vs. full log. It is never too early to start planning your home or log cabin. Get started today and call us at 800-341-1566 or drop us an email. We are looking for a log home, mostly on one floor that can be used for a veteran in a wheelchair. He has a VA Secially Adapted Housing Grant which will be available to help in the purchase. A roll in shower, 36” or wider doorways, and egress from bedroom and front door by wheelchair are some items required. An attached garage is required. We would like a fireplace and a screened porch as well. We want to purchase land in Wolfeboro, NH for the home. Can you give me an approximate price range so that we can begin search? We have never had a home built like this. We believe our present home in Florida can be sold quickly. Thank you for any advice you can provide.